A cut-price GTX Titan for gamers, though not as versatile and still hugely expensive. Well, when I say "whole new" that needs to be qualified just a touch. Nvidia haven't suddenly forgotten all those roadmaps they've been showing off. This isn't one of the new Maxwell GPUs. The GTX 700 generation is essentially a refresh with the same basic graphical technology that we saw in the GTX 600 series, though the GTX 780 is itself a bit of an exception to that. It's actually taking the Titan's GK 110 GPU and shaving a little power off the top, giving us a card that performs slightly below Nvidia's state-of-the-art monster at a lower price point, ostensibly making the GTX 780 the oft-rumoured GTX Titan LE. An Nvidia spokesperson pitched it as being "for everyone who loved Titan but couldn't stump up to an £800 graphics card." Does that claim stand up? When you're talking about an £800/$1,000 graphics card then the massive £550/$650 price-tag Nvidia have stuck on the GeForce GTX 780 maybe doesn't sound so unreasonable. But still, with this new card they are once again pushing up the price of the top-end card of a graphics generation. Inside the trivalent chromium-plated exterior there's the aforementioned GK 110 GPU, but instead of the 2,688 CUDA cores of the GTX Titan Nvidia have chopped off an entire graphics processing cluster (GPC) cutting that figure down to 2,304. That's still a huge number of unified shaders compared with the GTX 680's 1,536 and is one of the main reasons why the GTX 780 is so close in performance compared with the GTX Titan. Another is the fact that while they've cut the amount of video memory in half, down to 3GB from 6GB, it's still running with that huge 384-bit memory bus. The GTX 780 also comes with a slightly higher base clock than the standard GTX Titan - 863MHz plays 837MHz there. 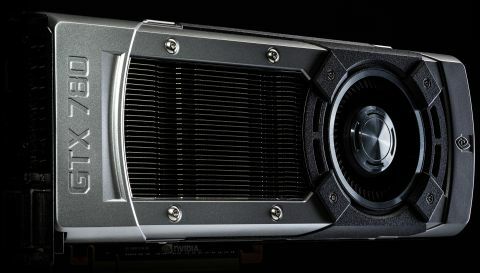 Nvidia are targeting high-end gamers with the GTX 780, not than the pro-graphics folk who saw the GTX Titan as a cheap way to get hold of a Tesla K20X professional card. To that end, Nvidia have disabled the double precision performance of the GPU inside the GTX 780, though that really wont make any difference when playing games. In performance terms, the GTX 780 is just shy of GTX Titan levels of gaming prowess. In this case "just shy" means about 10% slower than the card that's still retailing for around £250/$350 more. Usefully, like the Titan, the GTX 780 sports Nvidia's shiny new GPU Boost 2.0 tech you can overclock the living hell out of the poor GK 110 GPU. Thanks to the impressive and robust cooling solution Nvidia have tucked in behind those chromium plates, I was able to push the clock speed up to 1,189MHz. At those speeds the GTX 780 can easily outpace a stock-clocked Titan across the board. That still puts it some 20% slower than AMD's top card, the still somewhat irrelevant dual-GPU HD 7990, but compared with their best single-GPU card you're still looking anywhere up to 70% faster performance from the GTX 780 versus the HD 7970 GHz Edition. Does that justify the price? It's impossible to ignore the fact that this is the single most expensive graphics card launching a new generation I can remember. At £550/$650 it is a huge amount of money, though that might be because there's so much silicon in there – seven billion transistors versus three and a half billion in the GTX 680's GK 104 GPU. If you're considering a Titan, the price tag will seem less alarming. You're looking at a card that is almost as good in games for a good chunk less cash. The next card down the stack, the GTX 680, is around £200/$200 less but suffers the same performance hit compared with the GTX 780 as AMD's HD 7970 GHz Edition. That kind of puts the GTX 780 in a bit of a no-man's land between the affordable hobbyist cards of this technology generation and the likes of the aspirational, ultra-enthusiast class of cards like the GTX Titan, HD 7990 and GTX 690. With the GTX 780, Nvidia have almost created a new class of card sitting between enthusiast and ultra-enthusiast. Semi-mega-enthusiast? The GTX 780 is also a card only for those lucky or well-off enough to be gaming on a panel, or set of panels, with a native resolution higher than 2560x1440. You really need to be pushing that much graphical data through your GPU to justify the purchase. At 1080p your expensive new card will just be bored twiddling its silicon thumbs while it idly throws polygons around your relatively low-res screen. If you have the screen space, the GTX 780 represents a pretty significant performance boost over the GTX 680 and in those terms it's tough to argue against it, but it's also got a huge price premium which is going to push a lot of people further down the GTX 700 series stack. Unfortunately, I'm not allowed to say anything about those cards right now. Nvidia have put the GTX 780 out on its own, with nothing to really compare it against apart from one card that's £250/$350 more expensive and a couple that are some £200/$200 cheaper. With AMD holding their next generation cards back until the end of the year the GTX 780 will have that middle ground all to itself. It's almost like Nvidia has put a mark in the sand, challenging AMD to step up to it with their top card of the next generation. Even if you do fork out that much cash for the GTX 780 you can't lay any claims to owning "the fastest card." That's something which, before Titan, you could pretty much guarantee with the new top card of a generation. With the GTX 780 you're going to be paying out for second tier gear. At £550/$650 the GTX 780 has still been priced out of the reach of many of us PC gaming enthusiasts, and we're going to have to readjust our sights down to the lesser lights of the GTX 700 series. The GTX 780 may be quick, but it sure is a pricey bit of kit. All the benchmarks in this test were carried out on my standard Intel Core i7-3770K test bench. The CPU is running at stock speeds with 16GB DDR3 RAM running at 1,600MHz. The benchmarks were run at 2560x1600, at their highest settings. With the exception of Crysis 3 they were all run with 4x MSAA as well. The first result is the average frame rate and the number in parenthesis is the minimum frame rate.